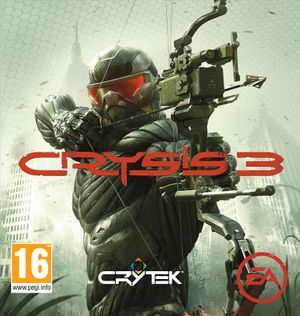 The PC version features high resolution textures, tessellation, high quality shadows and more PC-specific features. 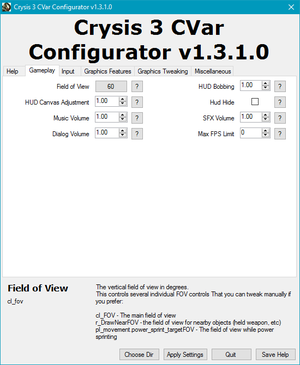 The Crysis 3 CVar Configurator is an official tool for adjusting the field of view, disabling mouse acceleration and smoothing, and enabling borderless fullscreen windowed mode. 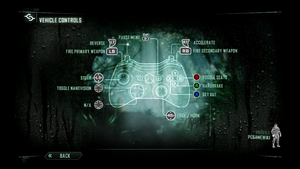 Crysis 3 CVar Configurator unlocks many options. 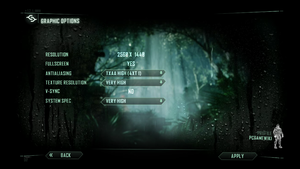 An official configuration tool created by Crytek UK which lets you tweak game settings easily. MaLDo OnTheFly utility lets you change the graphics options within the game just by pressing a key, switch HUD on and off, change FOV and more from within the game. Unofficial tool, which may result in multiplayer ban. Default is 55° vertical. 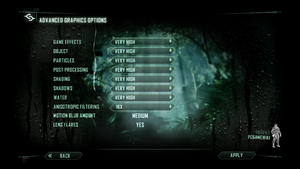 Use Crysis 3 CVar Configurator. 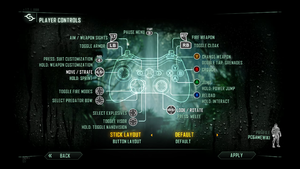 Use Crysis 3 CVar Configurator. 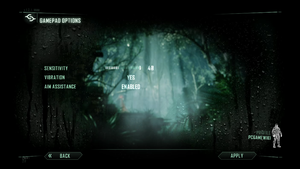 TXAA (Nvidia only) (causes texture blurring), FXAA, SMAA and MSAA. Hacking is hardcoded to the "H" key and cannot be rebound. 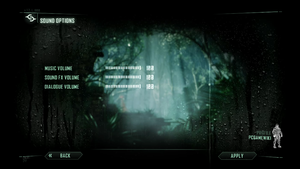 See Helix Mod: Crysis 3. Problem is normally caused by faulty or underpowered power supply, or overworked graphics card. Every time when level ends with outro, game needs at least 600-700 MB of free RAM on low details, to not show the error during first loading of a next level. Use option "deep cleaning" in Smart RAM. In result of deep cleaning option, big amount of RAM is freed. You'll encounter short unresponsibility of the system (according to working of versions of the Smart RAM to at least versions till ~August 2016). When computer will be responsive again, just come back to the game. You can normally change the details, immediately after first loading of a level. Since now, game loads normally during the whole level, without any problem, till the next one. Similar functionality can have CleanMem, but not tested. Reboot Origin into safe mode. There is a problem with ingame hacking mechanics, where successful hacking will end in no expected result. 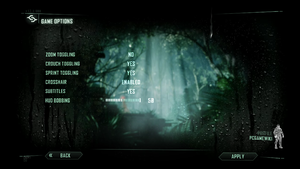 Example: hacking tutorial will not end, door will not open shortly after single player campaign starts. There seems to be problem with binding F key. Keep F key unbound or bind it to USE action. The game may crash with the above error message when launching a campaign mission. 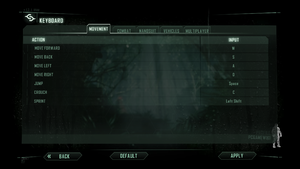 Launch Crysis3.exe as an administrator to avoid this. Hi-performance specifications: 8 GB, Intel Core i7-2600k or AMD Bulldozer FX4150 with AMD Radeon HD7970 or Nvidia GeForce GTX 680. This page was last edited on 31 March 2019, at 09:16.